There are beautiful fairy scene exist somewhere around us, there are “forgotten paradise” in our world, one of them is Tuyet Tinh Coc Dalat. Recently, the backpackers have told to each other about a green “turquoise” lake with upstanding cliffs surrounded by green pine forest. 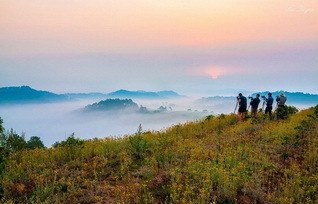 This place is so beautiful that regardless of geographical distance quite far from the center of Dalat city and bumpy path, young people want to reach this place for fantastic photos. 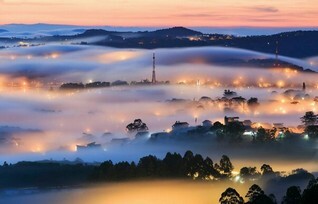 Dalat Trip will share with you all the information about this new destination. This new photo shooting spot is located in Suoi Can village, Lat commune, Lac Duong district, Lam Dong province. Its location is quite far from Dalat city center, about 30 km from Dalatmarket. This new place was discovered by the backpackers who travel by motorbike and put information on the internet in the early 2017. From the gate of Cu Lan village, you go further 500m to see a stone slope up the mountain on the left hand side. At this fork, you will find a small water stall built with tarpaulin. You leave your car here and contact the driver of the jeep (some drivers are always wait here) to be transported to Tuyet Tinh Coc. Because the distance of 7 km from the asphalt road to the tourist site is quite bumpy and slippery so you absolutely should not drive the car there, your car will certainly be mired. You should take the jeep, which can go on slippery terrain with price about 150.000 VND / 1 person / return. One jeep is for 7 people and takes about 15 to 20 minutes of transferring. You will follow the route to Cu Lan village as described above. All are asphalted roads that easy for driving. Passing through the Cu Lan village about 500 m, you will see a small dirt path on the left hand side. From here is the forest path, bumpy and quite slippery when it rains. From the Provincial Road 722, you turn left onto the gravel road, go up the slope and turn left, continue to crossroad and turn right, continue to turn left downhill to meet the small wooden bridge, go straight until you see Tuyet Tinh Coc. You can ask the local people how to go to the lake of the Bay Tai stone quarry. The way to Tuyet Tinh Coc is very suitable for young people, who love to travel by motorbike, adventure and explore. Although the path into the Tuyet Tinh Coc is quite difficult but in return, the scene two sides of the path is very nice, wild and poetic. “The reward” for a long and difficult journey is the sight of the sky and water looks like in fairy tales. In front of your eyes is a clear and blue lake has strange watercolor likes jade, it can be said: as beautiful as in dream. This place originated from an abandoned quarry, after a long period of inactivity, the underground water and rainwater contained on the rock formed a large and clear lake with blue color like seawater. Stagnant water at quarries is usually blue in color because of the minerals that are mixed in water. Looking down from high position, the lake looks like a turquoise in the middle of a green forest. This particular color of water has made the travelers feel like straying between beautiful paradises in the martial arts story movie of Jin Yong (Chinese writer). Around the lake that reflects the image of the sky and cloud are the colorful high cliffs, divided in a lot of shapes and sizes making the place more beautiful. Four directions are majestic mountains, unspoiled landscape, peaceful scenery, sky and water are mixed in a color, and it is really a rare place on the earth. This place is suitable for those who want to have stunning photo. Young people can choose for themselves the shimmering shooting angles on the rocks, looking down the blue lake, looking towards the pine forest or facing to the cliff…. Everywhere you can create masterpieces of photos to record a beautiful youth period. Especially, this place is very clean and wild with no garbage, young people are also very conscious of natural and environmental preservation. The area is also well suited for outside activities: picnic, camping, trekking, team building…. Because, there is about 7 km off-roading, you need to choose the appropriate means. If you ride a motorbike, you should ride a motorcycle or a gear motorbike. If you drive a car, you should choose off-road vehicle with extended ground clearance, off-road tires and drive train. Especially you should not using automatic scooters, 4 – 7 seaters car with low chassis because the car is very easy to be mired. Women should not ride motorbike but should go with a man and lets him ride the motorbike to handle difficult distances of the path. Should go in groups of 3 motorcycles or more to be able to support each other when the accident occurred because the forest path is quite long, rugged, deserted, and lonely. Pay attention to safety; do not take pictures in dangerous locations, carefully falling into the lake because the lake here is deep surrounded by the upstanding cliffs. Absolutely do not swim even if you swim well. Because the water in the lake is very deep and cold, it is easy to cause cramping and drowning. Before you leave, collect the rubbish into your bag. Do not litter indiscriminately causing messy of landscapes. Bring drinks or snacks because there are no shops and services along the 7 km path and at destination.